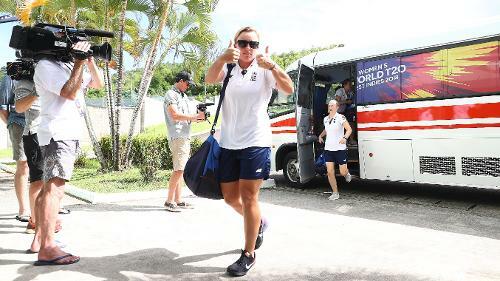 Danielle Hazell of England arrives ahead of the ICC Women's World T20 2018 match between West Indies and England at Darren Sammy Cricket Ground on November 18, 2018 in Gros Islet, Saint Lucia. 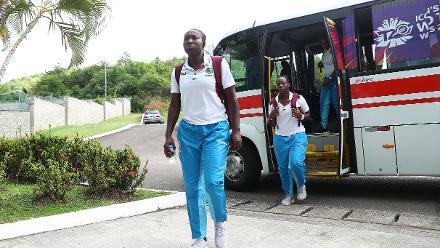 Stafanie Taylor of Windies arrives ahead of the ICC Women's World T20 2018 match between Windies and England at Darren Sammy Cricket Ground on November 18, 2018 in Gros Islet, Saint Lucia. 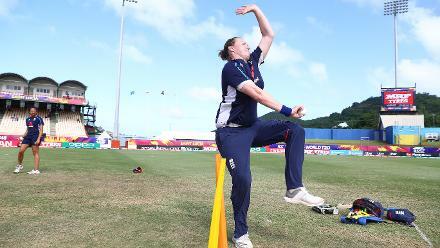 Anya Shrubsole of England warms up ahead of the ICC Women's World T20 2018 match between Windies and England at Darren Sammy Cricket Ground on November 18, 2018 in Gros Islet, Saint Lucia. 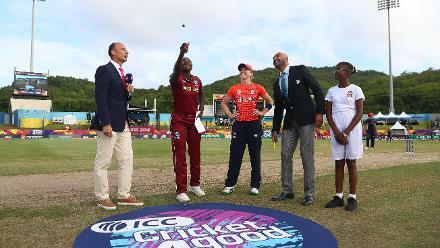 Stafanie Taylor of Windies and Heather Knight of England pictured during the coin toss ahead of the ICC Women's World T20 2018 match between Windies and England at Darren Sammy Cricket Ground on November 18, 2018 in Gros Islet, Saint Lucia. 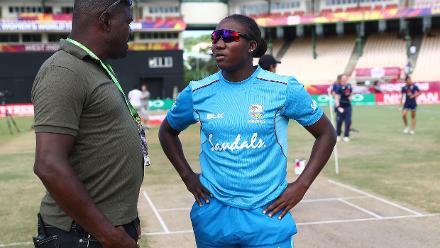 Stafanie Taylor of Windies talks to groundsman Kent Crafton during the ICC Women's World T20 2018 match between Windies and England at Darren Sammy Cricket Ground on November 18, 2018 in Gros Islet, Saint Lucia. 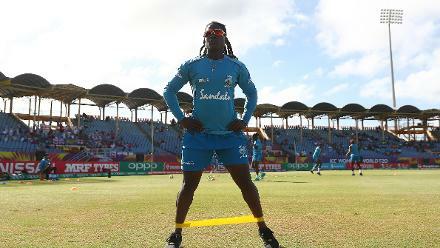 Deandra Dottin of Windies warms up ahead of the ICC Women's World T20 2018 match between Windies and England at Darren Sammy Cricket Ground on November 18, 2018 in Gros Islet, Saint Lucia. 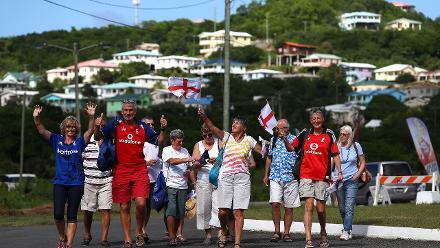 England cricket supporters arrive at the stadium ahead of the ICC Women's World T20 2018 match between Windies and England at Darren Sammy Cricket Ground on November 18, 2018 in Gros Islet, Saint Lucia. 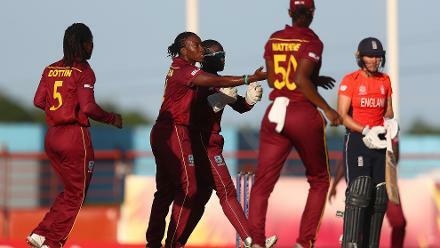 Shakera Selman of Windies celebrates the wicket of Natalie Sciver of England during the ICC Women's World T20 2018 match between Windies and England at Darren Sammy Cricket Ground on November 18, 2018 in Gros Islet, Saint Lucia. 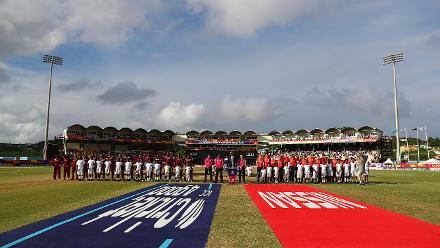 Windies line up against England during the ICC Women's World T20 2018 match between Windies and England at Darren Sammy Cricket Ground on November 18, 2018 in Gros Islet, Saint Lucia. 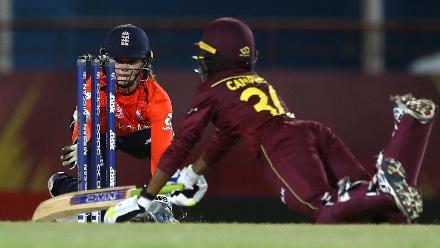 Tammy Beaumont of England sweeps the ball towards the boundary during the ICC Women's World T20 2018 match between Windies and England at Darren Sammy Cricket Ground on November 18, 2018 in Gros Islet, Saint Lucia. 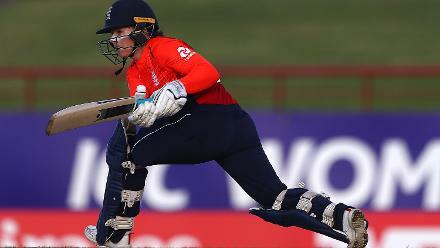 Danielle Wyatt of England looks on during the ICC Women's World T20 2018 match between Windies and England at Darren Sammy Cricket Ground on November 18, 2018 in Gros Islet, Saint Lucia. 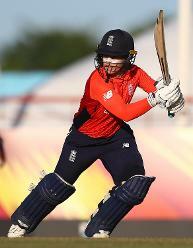 Tammy Beaumont of England hits the ball towards the boundary during the ICC Women's World T20 2018 match between Windies and England at Darren Sammy Cricket Ground on November 18, 2018 in Gros Islet, Saint Lucia. 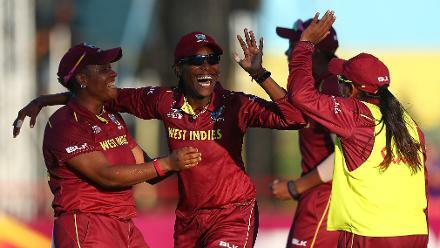 Chinelle Henry of Windies celebrates catching Danielle Wyatt of England during the ICC Women's World T20 2018 match between Windies and England at Darren Sammy Cricket Ground on November 18, 2018 in Gros Islet, Saint Lucia. 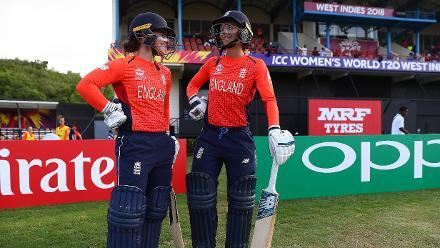 Britney Cooper of Windies is congratulated on2 running out Lauren Winfield of England during the ICC Women's World T20 2018 match between Windies and England at Darren Sammy Cricket Ground on November 18, 2018 in Gros Islet, Saint Lucia. 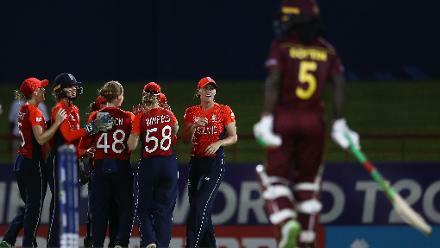 Sophia Dunkley of England sweeps the ball, Kycia Knight of Windies looks on during the ICC Women's World T20 2018 match between Windies and England at Darren Sammy Cricket Ground on November 18, 2018 in Gros Islet, Saint Lucia. 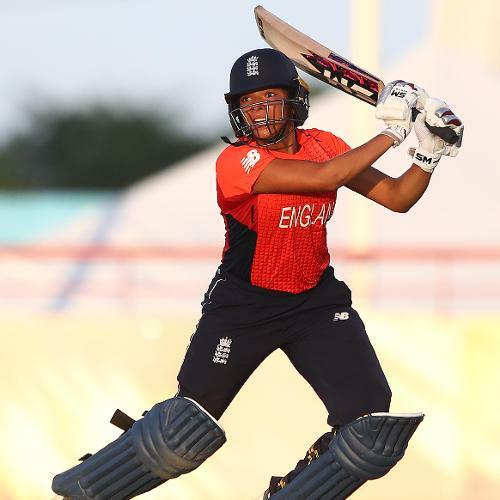 Sophia Dunkley of England hits the ball towards the boundary during the ICC Women's World T20 2018 match between Windies and England at Darren Sammy Cricket Ground on November 18, 2018 in Gros Islet, Saint Lucia. 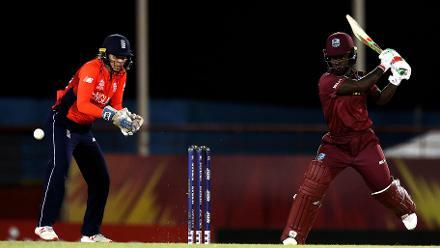 Deandra Dottin of WiIndies pulls the ball towards the boundary, asAmy Jones of England looks on during the ICC Women's World T20 2018 match between Windies and England at Darren Sammy Cricket Ground on November 18, 2018 in Gros Islet, Saint Lucia. 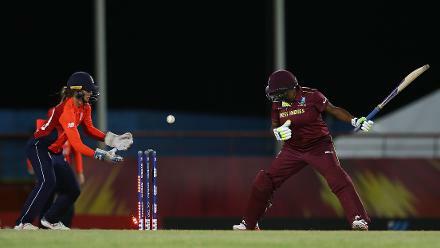 Deandra Dottin of Windies hits the ball towards the boundary, as Amy Jones of England looks on during the ICC Women's World T20 2018 match between Windies and England at Darren Sammy Cricket Ground on November 18, 2018 in Gros Islet, Saint Lucia. 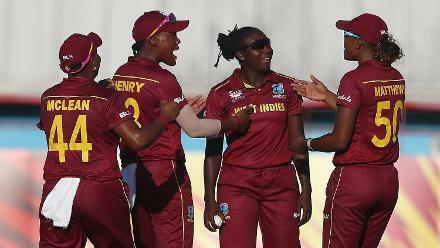 Stafanie Taylor of Windies is congratulated on catching Amy Jones of England during the ICC Women's World T20 2018 match between Windies and England at Darren Sammy Cricket Ground on November 18, 2018 in Gros Islet, Saint Lucia. 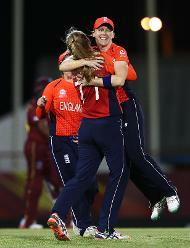 Anya Shrubsole of England is congratulated, after bowling Hayley Matthews of Windies during the ICC Women's World T20 2018 match between Windies and England at Darren Sammy Cricket Ground on November 18, 2018 in Gros Islet, Saint Lucia. 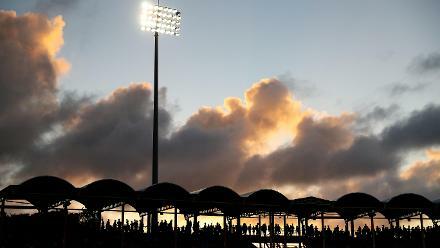 The sunsets over the Daren Sammy Cricket ground during the ICC Women's World T20 2018 match between West Indies and England at Darren Sammy Cricket Ground on November 18, 2018 in Gros Islet, Saint Lucia. 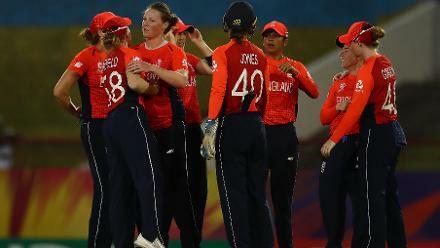 England celebrate the wicket of Deandra Dottin of Windies, after she was caught by Danielle Wyatt of England during the ICC Women's World T20 2018 match between Windies and England at Darren Sammy Cricket Ground on November 18, 2018. 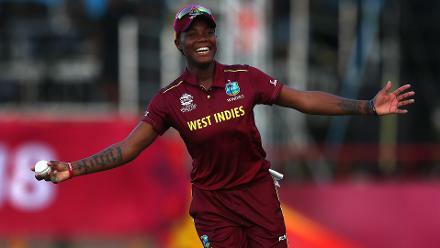 Britney Cooper of Windies celebrates running out Lauren Winfield of England during the ICC Women's World T20 2018 match between Windies and England at Darren Sammy Cricket Ground on November 18, 2018 in Gros Islet, Saint Lucia. 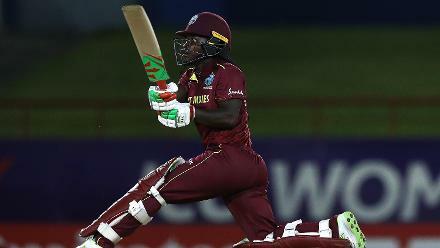 Deandra Dottin of Windies hits a six during the ICC Women's World T20 2018 match between Windies and England at Darren Sammy Cricket Ground on November 18, 2018 in Gros Islet, Saint Lucia. 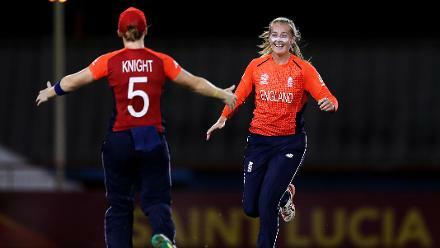 Heather Knight of England congratulates Sophie Ecclestone of England on bowling Natasha McLean of Windies during the ICC Women's World T20 2018 match between Windies and England at Darren Sammy Cricket Ground on November 18, 2018. 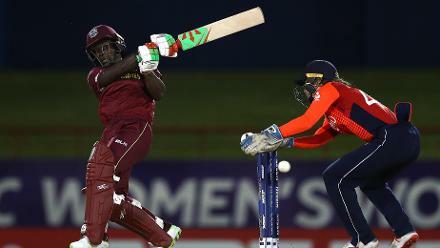 Natasha McLean of West Indies looks on, after being bowled by Sophie Ecclestone of England during the ICC Women's World T20 2018 match between West Indies and England at Darren Sammy Cricket Ground on November 18, 2018 in Gros Islet, Saint Lucia. 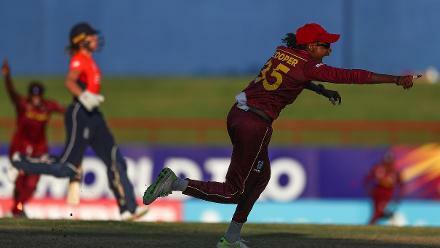 Shemaine Campbelle of Windies sweeps the ball towards the boundary, as Amy Jones of England looks on during the ICC Women's World T20 2018 match between Windies and England at Darren Sammy Cricket Ground on November 18, 2018. 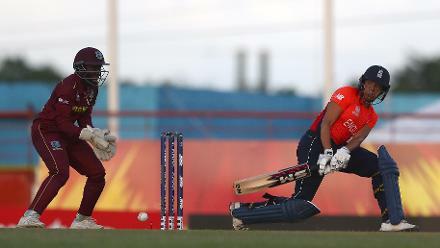 Amy Jones of England looks to run out Shemaine Campbelle of Windies during the ICC Women's World T20 2018 match between Windies and England at Darren Sammy Cricket Ground on November 18, 2018 in Gros Islet, Saint Lucia. 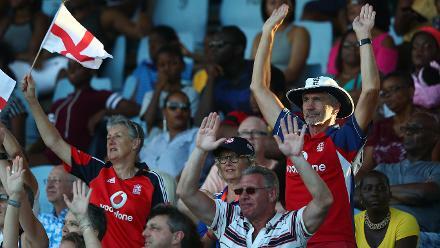 England fans show their support during the ICC Women's World T20 2018 match between Windies and England at Darren Sammy Cricket Ground on November 18, 2018 in Gros Islet, Saint Lucia. 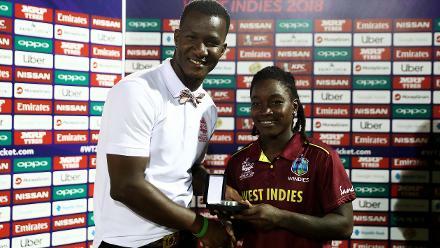 Daren Sammy presents Deandra Dottin of Windies with the 'Player of the Match' award after the ICC Women's World T20 2018 match between Windies and England at Darren Sammy Cricket Ground on November 18, 2018 in Gros Islet, Saint Lucia. 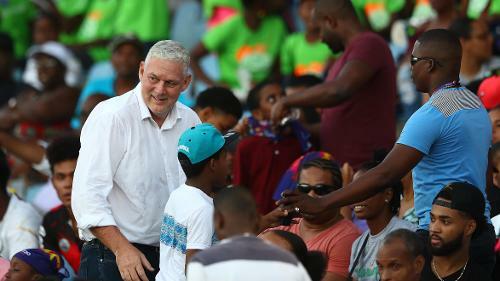 Allen Chastanet, Prime Minsiter of St Lucia pictured during the ICC Women's World T20 2018 match between Windies and England at Darren Sammy Cricket Ground on November 18, 2018 in Gros Islet, Saint Lucia. 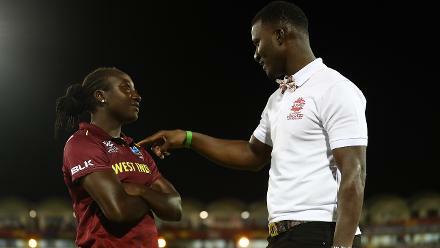 Daren Sammy talks to Stafanie Taylor of Windies after the ICC Women's World T20 2018 match between Windies and England at Darren Sammy Cricket Ground on November 18, 2018 in Gros Islet, Saint Lucia. 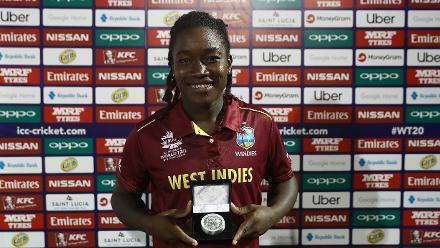 Deandra Dottin of Windies pictured with the 'Player of the Match' award after the ICC Women's World T20 2018 match between Windies and England at Darren Sammy Cricket Ground on November 18, 2018 in Gros Islet, Saint Lucia.